I spent a lot of time in Kolkata last year and the urge to learn more about everyday Bengali food became stronger and stronger as I spent time there. On previous visits I had bought many recipe books written in Bengali, some dating back to the late 1800s even, and the food I ate at my aunt's table motivated me to return to those books when I was back home in Mumbai. My list of dishes to try out grew and grew. Many of these I've never eaten before but they seemed interesting and I decided to try them out one by one as I read more and more about Bengali cuisine and its recipes in books, magazines, blogs and websites. 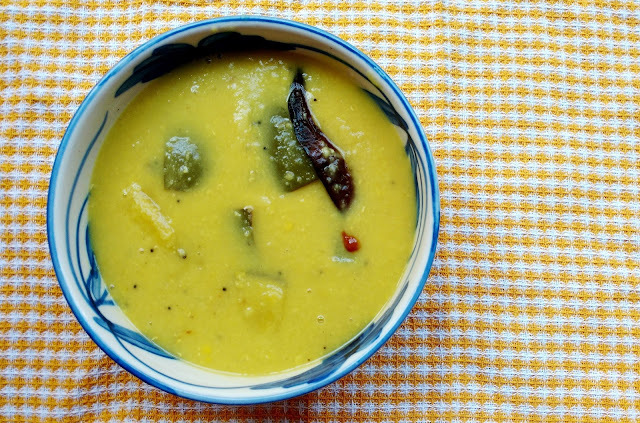 Since mango season is on and raw mangoes are still available I made Aam Daal, something ideal for summer. I also liked the idea of cooking with something in the correct season instead of randomly cooking without thinking. I felt I was, in a way, cooking like our grandmothers did. Wash the masoor daal well and then pressure cook with enough water and the turmeric powder. Wash the mango well and cut into large chunks or slices. Heat mustard oil in a wok or kadhai and temper with the kashmiri chillies and mustard seeds. 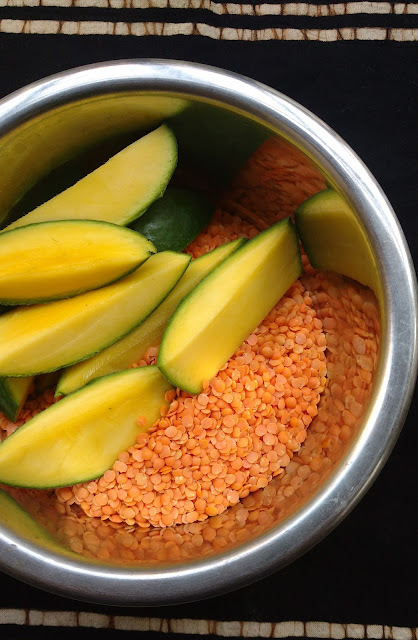 Once the mustard seeds have finished popping add the raw mango pieces and fry on a medium flame till the mango pieces begin to soften. Put the boiled daal (still in the cooker) on the flame and add the sauteed mangoes and spices to the daal. Add water as required and bring it to a boil and add salt. 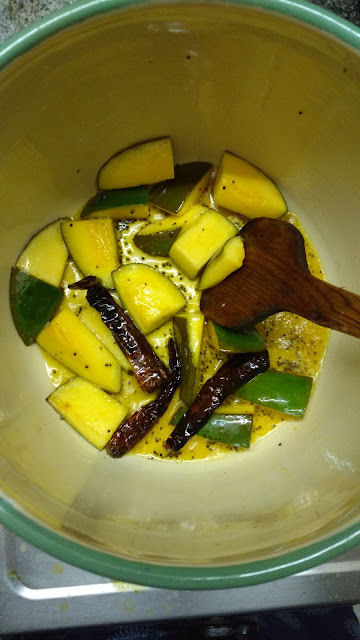 Stir well and let it simmer till the mango is cooked but still firm. Serve with plain steamed rice and a vegetable.